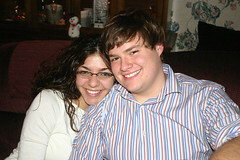 This is my brother Kevin and his girlfriend Talia. They actually were in band together in high school. He even took her to the senior prom. Now they are both in college...she goes to St. Mary's and he's at Ball State. Aren't they a cute couple?